I’ve bought a few things to see whether they are engrave-able or not. If they work out well, then, note this, I’m going to give them away to my readers. For free. Yes. Really. If I screw them up, then I’ll have a few more shooting targets, or maybe someone would still want them. The only thing I haven’t figured out yet is how to give them away. The simplest would be to pick random commenter from people who’ve commented on the ‘Give Away’ post, but maybe someone has a better idea? OK, here they are. 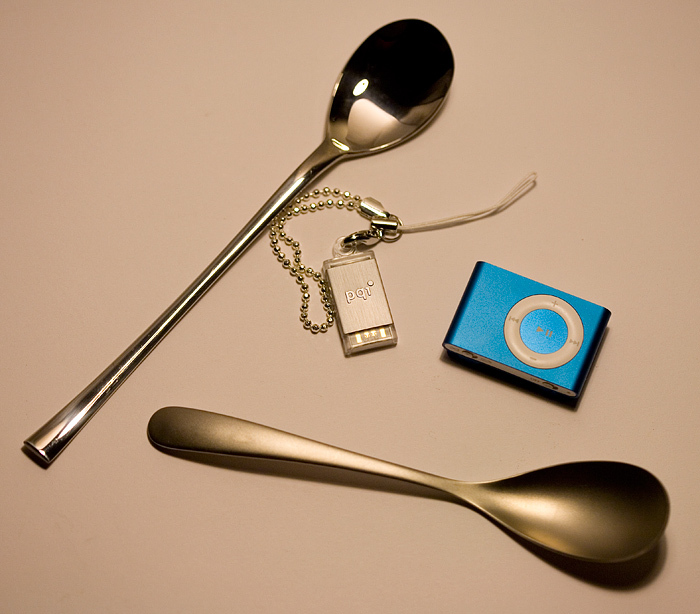 ‘Top’ things are 1GB iPod Shuffle and pqi 2GB memory stick. Actually I bought Shuffle just to test whether this aluminium is engrave-able and how the effect looks like. If it is good enough I’ll probably buy iPod Nano for one of the next give aways. I have a few spoons too, but not sure which of them are made of metal that can be engraved.